A brazen assault on a high-rise block in central Kabul which paralysed the embassy district in a 20-hour standoff was carried out by fighters from the Haqqani network, officials said. The attack was coordinated with three other suicide attacks in the city and finally ended when troops stormed the upper floors of their hideout to kill the remaining attackers. Fourteen Afghan civilians and police were killed in all across the city in the multi-pronged assault and another 28 wounded. Six Nato troops were also hurt. The Pakistan-based Haqqani network of militants is closely allied with the Taliban and is widely considered by Western diplomats to be a strategic asset of Pakistanâ€™s military. Ryan Crocker, the American envoy to Kabul, said the network had also carried out a lorry bombing at the weekend which wounded 77 American soldiers at a combat outpost in Wardak province. He said: â€œThe information available to us, is that these attackers, like those who carried out the bombing in Wardak are part of the Haqqani network. â€œThey enjoy safe haven in Nothern Waziristan. Itâ€™s tough when youâ€™re trying to fight an insurgency that has a lot of support outside the national borders.â€ Jalaluddin Haqqani, the veteran Mujahideen fighter who founded the network, was once a CIA favourite and won funding and arms for his anti-Soviet resistance. He has long since turned on his former American sponsors and he and his son Sirajuddin are both considered â€œirreconcilablesâ€ opposed to any peace settlement. His network is now intimately aligned with the Taliban and former Taliban officials say Haqqani representatives sit on the movementâ€™s ruling Quetta Shura. The network is notorious for its spectacular attacks by teams of suicide commandos and has been blamed for some of the most infamous attacks in Kabul, including an assault on the Serena Hotel. Tuesdayâ€™s attack was â€œsimilar to attacks carried by Haqqani,â€ a spokesman for the Afghan interior ministry said. After seizing the tower, the attackers used its commanding views to fire rocket-propelled grenades (RPGs) at Afghan ministries, the US embassy and Nato HQ. 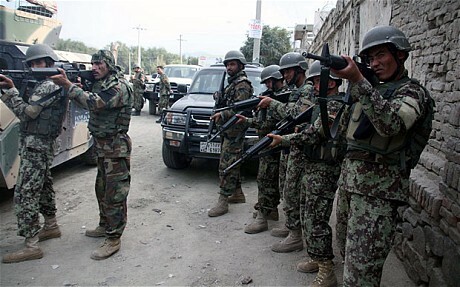 The second day of the siege began with American Blackhawk helicopters circling the half-built block after militants had kept Nato and Afghan forces at bay throughout the night. Regular explosions and gunfire could be heard as soldiers in Afghan and Nato camouflage could be seen taking positions on the third-from-top storey. The final floors were finally cleared just before 9am. An interior ministry official said six attackers had been killed in the building. The ferocity of the struggle was evident from hundreds of spent bullet casings and pins from grenades littering the buildingâ€™s shell. The rooms where the fighters had made their last stand were freckled with bullet holes and shrapnel marks. The American ambassador said six rocket propelled grenades had landed in the embassy compound, but insisted the attack was â€œnot a very big dealâ€.